Our Mexican-inspired vegetarian quinoa soup is made with black beans, tomatoes, fresh jalapeño pepper, carrot, and celery. 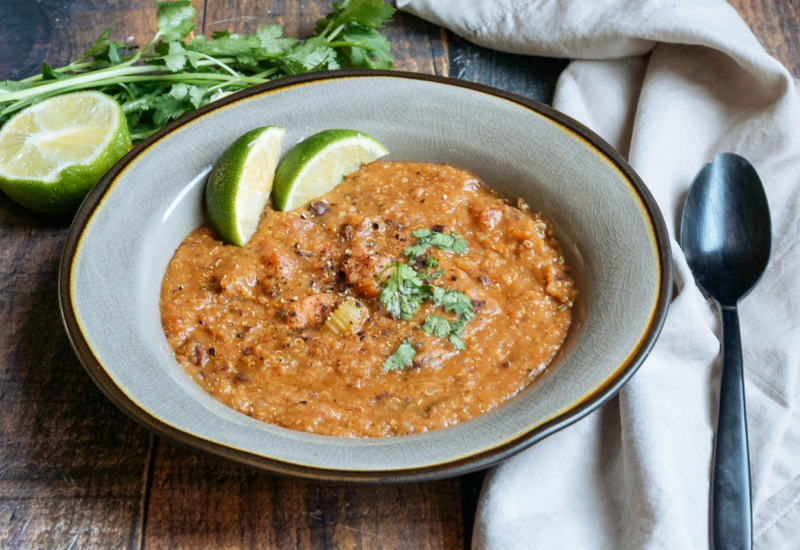 Cumin lends a warm, sweet, and spicy flavor to this aromatic dish that is perfect for cold-weather days when you're craving something nutritious and filling. If you really want to bring the heat, include the jalapeno seeds and ribs when chopping the peppers. That's where all the powerful spice is kept! Heat olive oil in a pressure cooker to Sauté. Cook and stir onion, celery, carrots, and jalapeño peppers in hot oil until softened, 6 to 7 minutes. Stir water, tomatoes, black beans, quinoa, cilantro, cumin, and sea salt with the vegetable mixture. Lock pressure cooker lid in place, turn steam vent handle to Sealing, and select Pressure Cook on High for 8 minutes. Let pressure release naturally before removing lid. Season chili with pepper to serve. Garnish with chopped cilantro, lime, and whatever other toppings you desire. Using citrus and fresh herbs are great tricks for adding flavor while still following a vegetarian/vegan, gluten-free, dairy-free, or low-carb diet. Per Serving: 272 calories; 4g fat; 47.2g carbohydrates; 15g protein; 0mg cholesterol; 1224mg sodium. This soup was really delicious! I love how versatile quinoa is. I almost hesitated using two jalapeños, but I am glad I did because it added delicious flavor without being overwhelming. The cumin and cilantro also gave it great flavor. I also used an immersion blender to puree the soup a little, but not too much, so that it still retained some its original texture. It was perfect! This vegetarian quinoa soup was really good. It had really delicious, authentic Mexican flavors with the jalapeño and cumin. It's perfect when you want something quick and easy. The pressure cooker makes quinoa in no time. I used an immersion blender to puree the soup all the way. It had really good flavor, not too spicy. Going to make it again soon. I really liked this quinoa soup. I used black beans, tomatoes, carrot, and celery, but left out the jalapeño. If you really like the flavor and spice of cumin, add a little extra. It's amazing! Definitely recommend blending when it's finished. Lots of good flavor and easy to make. I sautéed garlic too, and deglazed the pot with chicken broth before adding the beans and other ingredients. I changed things up a little because I don’t have a pressure cooker, and I only made one serving. But the combination of all the ingredients was reallyyy good! This was delicious! I cut the ingredients in half and used jarred jalapeños instead of fresh and it came out phenomenal. I also blended half of the soup but left some of it unblended for texture. A squeeze of lime before serving added even more flavor. My one-year-old loved this! I thought I had quinoa in the pantry, but alas I did not. So I used jasmine rice instead and was just as delicious. I will be making this again. I added vegetable bullion powder since I didn’t have celery and blended it all together at the end. It was sublime. So filling, warming and easy!